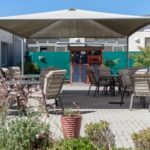 At Princess Christian Home Frail Care Tokai, we have skilled nursing staff on hand 24 hours per day to assist our residents with all their daily needs. 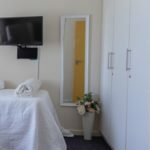 Residents also have the added security of being situated close to Constantia Medi Clinic, Melomed Tokai, as well as Medicross Tokai. And, a variety of entertainment and events. Our lounges are stocked with a wide range of movies and music DVDs as well as a DSTV bouquet. We also have a well-stocked library to fill hours of enjoyment, reading in any of our two lounges or our beautiful gardens. The hairdressing salon is open on a weekly basis. A chiropodist service is available every six weeks. 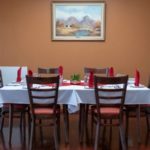 Residents enjoy a full dining experience at breakfast, lunch and dinner for which nutritious meals are planned by Dieticians, and prepared in our fully equipped kitchen. Our manicured gardens are open to all our residents who can relax on the perfectly placed benches to enjoy the birdlife and outdoors. There’s also a secure and tended foot path that runs along the perimeter of the home which offers residents a safe and convenient exercise route. One of our main features is our beautiful aviary garden which is home to colourful and chirpy budgies. There’s also a large gazebo that shades tables and chairs so residents can enjoy being outdoors near Nature. 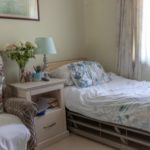 Our Assisted Living rooms have an en-suite bathroom. Our Frail Care residents have access to specially adapted shared bathroom facilities, designed specifically for the less-abled and frail. Our friendly carers provide residents with assistance to suit their needs. Residents are encouraged to furnish their rooms in their taste and style, giving them a sense of home and comfort. Contact Princess Christian Home Frail Care Tokai today.